TB10041 - Marco Beverage Systems Ltd.
Model variants UC4, UC10 & UC45 use an unregulated 24V DC power supply (1600366). The following update is to provide a stable 24v DC supply to the pump for improved performance & reliability. The existing pump power supply is to be replaced with a regulated power supply kit (1600366k) for model variants UC4/UC10 &UC45 twin pump variant. Contents include Regulated power supply, wire kit, 6 mounting clips and additional mounting bracket (For model UC4 only). The following update covers above models. 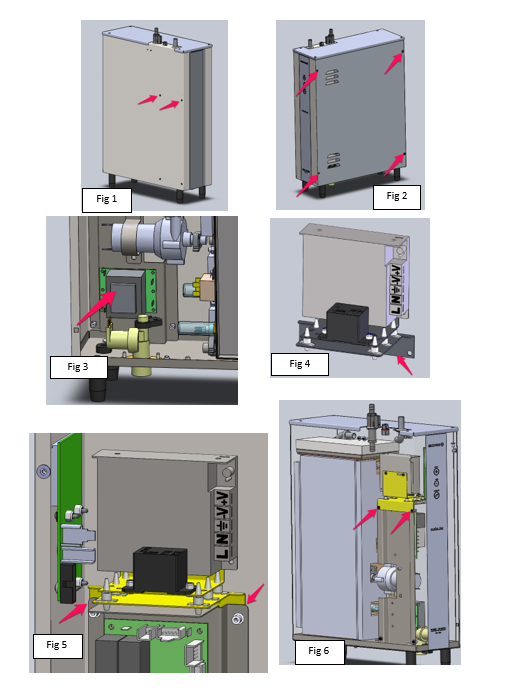 Depending on the model version, the technical bulletin is divided into three sections to cover each model version. Please reference the version applicable to you from below. The wiring diagram in Fig 8 is common for both UC4/UC10 only. It’s just the orientation of the PSU that is necessary to fit correctly. The following procedure should only be carried out by trained personal. Plug out the machine from mains supply. Remove the 2 screws on the left hand side as indicated by arrows in Fig 1. 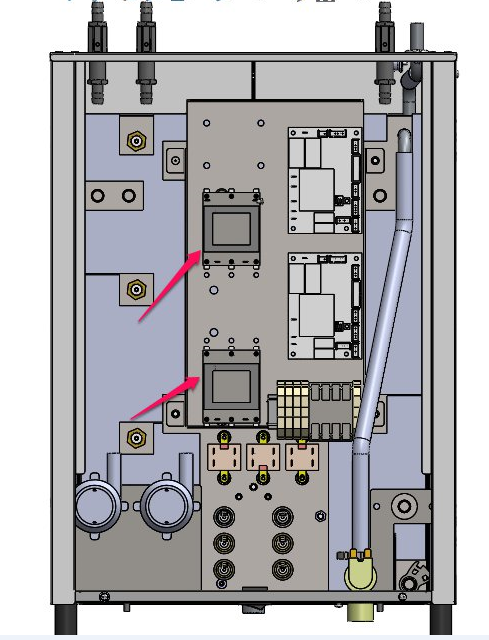 Remove the 4 screws on the right side as shown in Fig 2 to remove the service panel. Note: You may have to loosen the top 4 lid screws to remove/ fit the Service panel. Disconnect both the live (brown or black) and neutral (blue) wire from the old power supply and from the main PCB, these can be discarded. Cut cable tie and remove from circuit. Disconnect the positive (red) and negative (black or purple) pump wires from the old power supply (1600366) -these wires will attach to the new power supply assembly using their existing spade connections. Attach the new power supply assembly onto the adaptor bracket using the 6 plastic mounting clips as shown in Fig 4. Position the new power supply resting on top of the main PCB bracket as shown in Fig 5. 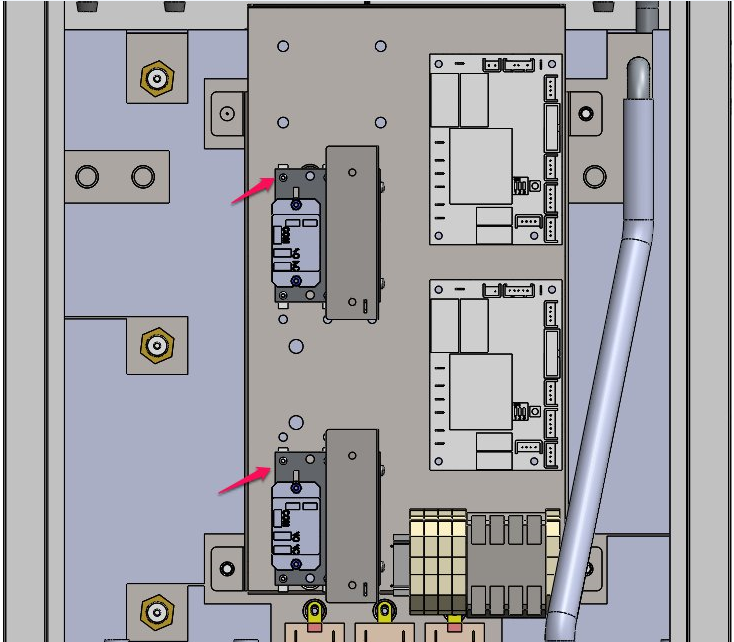 The original PCB bracket can be pulled forward slightly and the new brackets in yellow as per Fig 5 sit in behind the existing main PCB bracket. Replace the original 2 screws in the holes indicated in Fig 1 & Fig 6, the screw will pass through the new bracket and back into the original main PCB bracket holding it in place. Use the wiring diagram in Fig 7 & 8 to wire the new power supply to the PCB board. Use the piggy back connectors to connect the Live as shown in Fig 8. Ensure the earth cable is connected to the machine body. Replace the service panel and secure with the 4 screws shown in Fig 2. Plug out the machine from mains supply before commencement. Remove the old PSU supply from current position. Disconnect and discard the Live & Neutral wires from main PCB. You can cut the cable tie and remove from circuit. 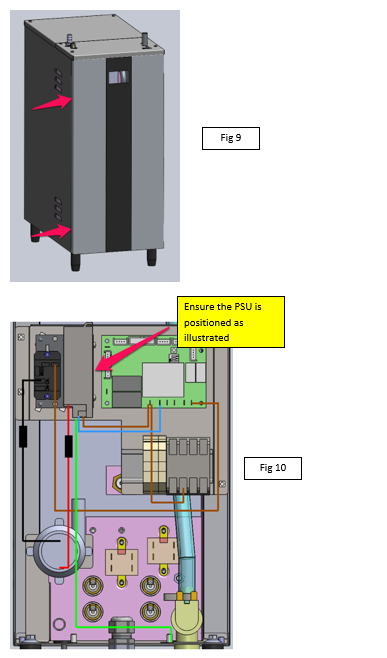 Position the new PSU on the 6 pillar supports as per Fig 10. Note: There is only one correct orientation so earth cable can reach base. See Fig 10 position and fit. 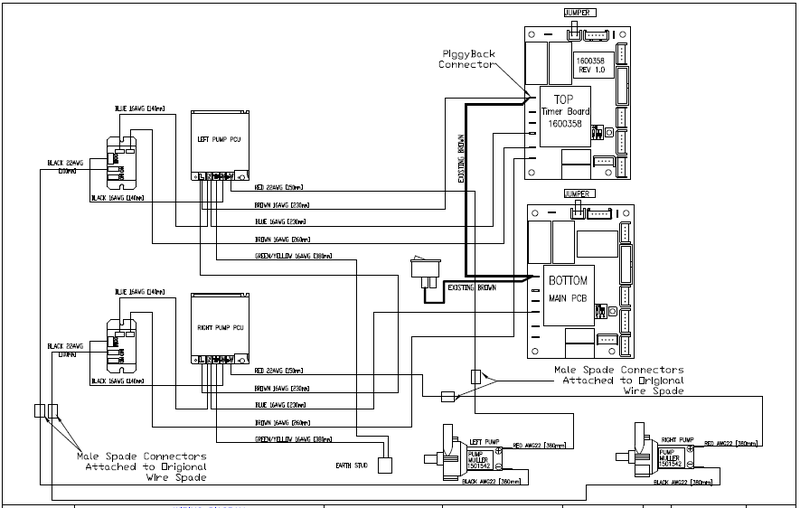 Use the wiring diagram in Fig 8 & 10 to wire the new power supply to the PCB board. Use the piggy back connectors to connect the Live as shown in Fig 8. Ensure the earth cable is connected to the machine body. Remove the old PSU supply from current position Fig 11. Disconnect and discard the Live & Neutral wires from main PCB. You can cut the cable ties and remove from circuit. Position the new PSU on the 6 pillar supports as per Fig 12. Note: There is only one correct orientation so earth cable can reach base. See Fig 12 position and fit. Use the wiring diagram in Fig 13 to wire the new power supply to the PCB board. Use the piggy back connectors to connect the Live as shown in Fig 13. Ensure the earth cable is connected to the machine body.